Yidi Sun‘s new paper is out now as an electronic publication ahead of print in the Journal of Cell Science. Congratulations to Yidi on her great work! The abstract is below. The PDF can be downloaded from JCS here. The functions of anionic phospholipids during clathrin-mediated endocytosis site initiation and vesicle formation. Sun Y, Drubin DG. J Cell Sci. 2012 Oct 24. PMID: 23097040. Anionic phospholipids PI(4,5)P(2) and phosphatidylserine (PS) are enriched in the cytosolic leaflet of the plasma membrane where endocytic sites form. 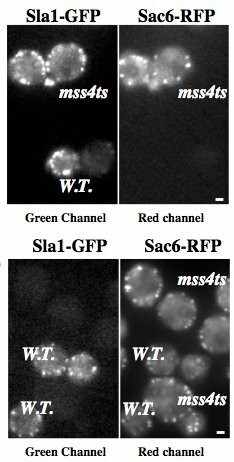 In this study, we investigated the roles of PI(4,5)P(2) and PS in clathrin-mediated endocytosis (CME) site initiation and vesicle formation in Saccharomyces cerevisiae. Live-cell imaging of endocytic protein dynamics in an mss4(ts) mutant, which has severely reduced PI(4,5)P(2) levels, revealed that PI(4,5)P(2) is required for endocytic membrane invagination but is less important for endocytic site initiation. We also demonstrated that in various deletion mutants of genes encoding components of the Rcy1-Ypt31/32 GTPase pathway, endocytic proteins dynamically assemble not only on the plasma membrane but also on intracellular membrane compartments, which are likely derived from early endosomes. In rcy1Δ cells, fluorescent biosensors indicated that PI(4,5)P(2) only localized to the plasma membrane while PS localized to both the plasma membrane and intracellular membranes. Furthermore, we found that polarized endocytic patch establishment is defective in the PS-deficient cho1Δ mutant. We propose that PS is important for directing endocytic proteins to the plasma membrane and that PI(4,5)P(2) is required to facilitate endocytic membrane invagination. This entry was posted in News and tagged actin, cell biology, clathrin, congratulations, early endocytosis, endocytosis, lipids, membranes, molecular biology, Publications on November 12, 2012 by NateKrefman.